spent the bulk of yesterday organizing my latest junk finds..
and i'm slowly amassing the next batch of goodies to put in my next book (called 'stuff & junk, an obsessed artist finds L.A.' - due out this fall/winter, cross my fingers..) it'll be similar to my last book, but focus purely on L.A. finds. I desperately needed to be inspired so thank you! a good sprucing up did my heart good, too. now i can FiND the stuff that i found..
am i THAT easy to read????? and holycrap i'm buying a clock from myself just so that i can use the box as a paper storting tray!!!!! EEEE E! what an awesome idea that I never thought of! good thing i hit enter before i meant to send!!!!!!! THANK YOU FOR THOSE FRAME PICTURES! i'm stealing miles and we're going to take a road trip out there to see you and learn how to make frames by the amazaing artworkslive! i'm waiting,just need to put a clean pair of socks in my back pocket and i'm packed...let's go! you and miles have an open invite, my dear! and i promise, i'll let you take back whatever you find on our MANY junk walks. we'll have a beeeeeee-laaaaaaaaaaaast!!!!!!!!! i laughed and said, 'yeah, but she'd prolly take it as a complete compliment..' i'm using HER treasure box to hold OTHER treasures. it's a beautiful marriage!!!!! You are SO busted, Becky! it's o.k., it's o.k. my soma still likes me..
Wow! 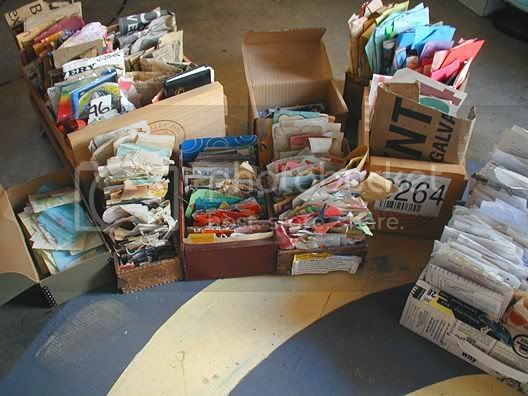 I'm organized but I never thought you could organize this stuff! What a great job! It's great looking just like that! BTW, do you read or like books? Great mail art books are Signs on the Wind and Postal Seance. I've just bought another one which should come next week. Hopefully it is good. If you need to know more about the books, just let me know. ooooo. thanks for the tip..i'll hafta look into these.. This is exactly what I need to do, and now you've shown me how. Thank you!! she said in a muffled voice from under all the junk! i stand corrected..how i WiSH you would've proofed my 1st book..
such a multi-cultural world we live in, i just assumed..
can you distinguish different asian languages, too? i have SO much, but don't know the origin..
your photography is really awesome. this community is worth a look. uuuuuh. you haven't even SEEN my work bench..
and thank the heavens above for little wooden boxes to put it ALL!!!!!! 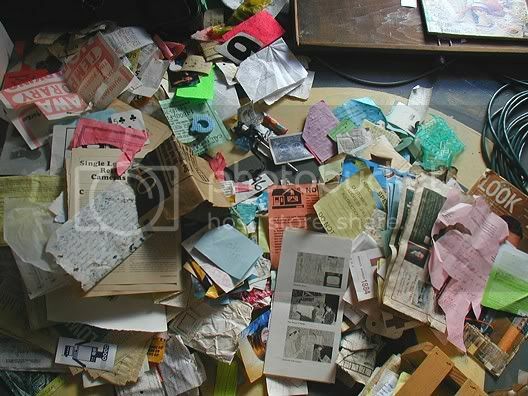 just got to see one of your pieces on collages site, great, nice to see more of your things, this post reminds me so much of claes oldenburg, I'm the same with a bunch of things like that for collage, just adds up. I look forward to getting your book one day, also could I add you to my friends list, its nice to see someone with such passion for art. thanks so much for the kind words..
i've added you, as well, my fellow passionate arteeeeest! I look forward to seeing you collages.